Another poor UI design. Adding a database using this layout is quite easy: click the icon with the plus (“+”) character over it. 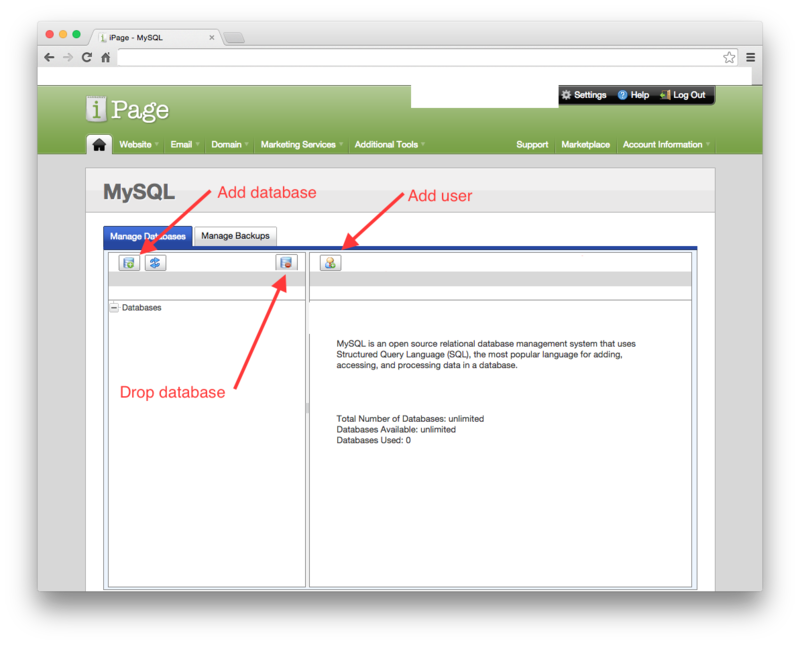 The current interface for adding a new database at iPage. Dropping a database, however, isn’t immediately obvious. The icon to do so appears to the right of the “add user” icon, in the right section of the page. It’s likely there because the UI designer(s) didn’t want users to mistakenly delete databases. OK. Understood. But, why not place the icon along the same row as the add database feature, but along the right margin? A suggestion about where the “drop database” feature might better appear. I contacted Hercules about a replacement, and they said they don’t sell parts. They advised me to buy a new stand, of course. Instead of spending upwards of $30 on a new stand and placing yet one more thing (that’s only 0.001% broken) in a landfill, I did some research. 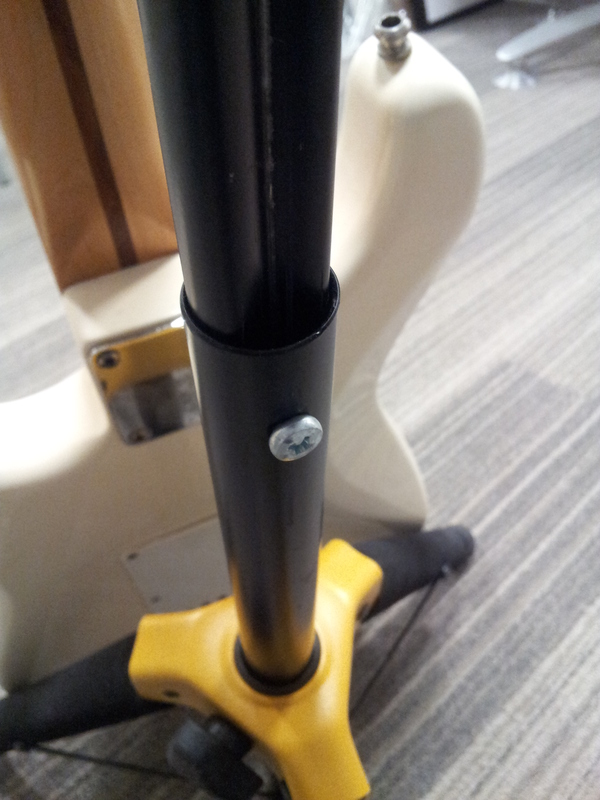 Using a pitch gauge, I found that an M5—0.8 × 20 mm screw will keep the neck of the stand in place. Home Depot carries the screw for $1.05. The SKU is 887480028287 and the screw may be found here. 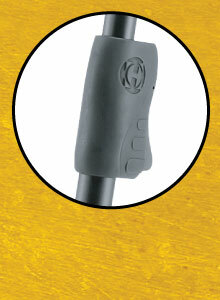 The trade-off for using this screw is the forfeited ability to use the stand’s one-handed adjustable feature. 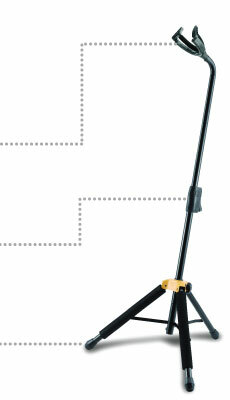 (To adjust the height, I will need to unscrew, re-position, and re-screw the stand’s neck.) No matter, I never used the adjustable height feature. Here’s an example of an incredibly terrible—and dizzying—user interface, or UI. 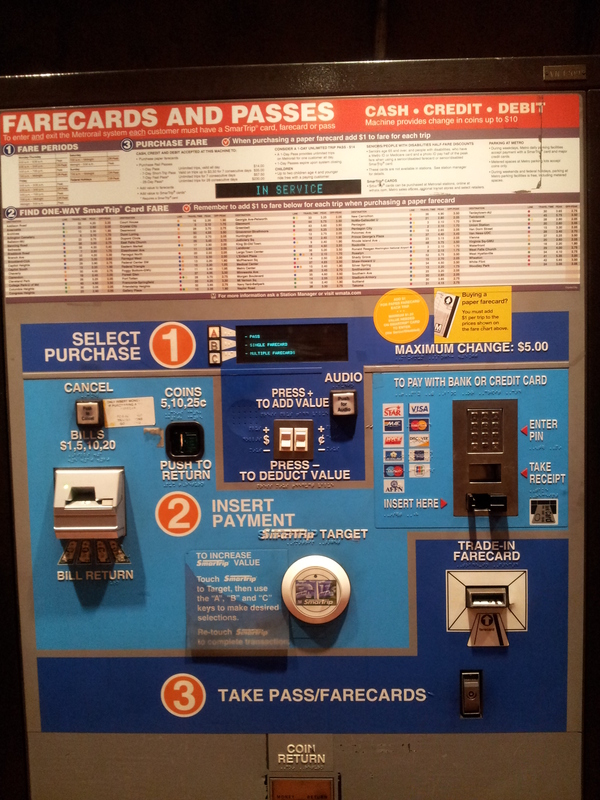 This is a farecard station in Virginia or Washington DC (I can’t quite remember). We spent about five minutes trying to figure the process out. (That’s four minutes too long.) We then requested the assistance of a very nice ticket booth clerk, and it took her another twenty-five minutes to explain it all to us. Let’s look at a few examples of why the UI fails. Note the “CASH • CREDIT • DEBIT” heading in the upper right hand corner. Beneath it you’ll note that you can get up to $10 in change during your transaction. But then, in the blue section marked “1” in which you can select a purchase, the maximum change is $5. Which is it? Under the “FARECARDS AND PASSES” section you’ll note “1 FARE PERIODS,” “2 FIND ONE-WAY SmarTrip Card FARE,” and “3 PURCHASE FARE.” The horizontal space below items “1” and “3” are shared, but item “2” has its own horizontal space. Also, items “1” and “3” share the same heading space; that is, both are on the same baseline and share the same brown background color. The next section takes a numerical, top-down approach (“1” on the top to start the purchase and “3” on the bottom to retrieve the farecard), but fuses elements of left-to-right navigation (in step “2” you can pay with cash on the left using the bill drawer or with a credit card on the right using a card swiper). Note the coin return all the way at the bottom. Why not put that directly beneath the coin slot above item “2 INSERT PAYMENT”?